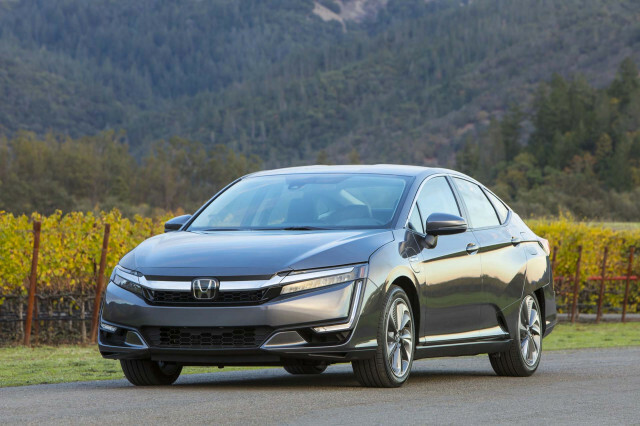 The Honda Clarity is a mid-size sedan available in with a choice among three powertrains: all-electric, hydrogen fuel cell (only available in very limited areas of California), and a more popular plug-in hybrid with a battery and engine. The Fuel Cell version is the follow-up to the first-generation Honda FCX Clarity leased to a few California drivers from 2008 through 2014. Only about 60 first-generation Clarity cars were leased—they couldn't be bought outright—and each was rumored to have cost Honda well into the six figures. The Clarity Electric is the successor to the 1,100 Honda Fit EV electric hatchbacks leased from 2012 through 2014, many of them still on the road. It's a mid-size sedan, rather than a compact hatchback like the Chevrolet Volt or Toyota Prius Prime. For 2019, the Clarity remained identical to the year before it. Both the fuel-cell and battery-electric versions of the Clarity are very limited in volume, and will be offered only in California. Their volume will likely be just a few hundred a year for each, no more than a rounding error for Honda's popular Civic, Accord, and CR-V models, each selling more than 300,000 a year. The Clarity Plug-In Hybrid will be sold in all 50 states and could reach 20,000 a year or higher, Honda says. The 2018 Honda Clarity Plug-In Hybrid will join the crowd, and likely will be the best seller among the three. It has an EPA-rated electric range of 47 miles, far higher than the Prius Prime's 25 miles and close to the smaller Chevy Volt's 53 miles. The Clarity's design is futuristic and has more ornamentation, vents, trim and accent lines than the two iterations of the concept car that previewed it. The chrome bar that underlines the grille opening and sweeps over the thin, swept-back LED headlights is a recognizable Honda design element. The flat top of the rear wheel arch, angled slightly forward, may be the most dissonant stylistic element. Overall, it has a slightly bulbous, heavy-hipped look. Every Clarity Fuel Cell has a glossy black roof with a chrome arc along the pillars and roof edge that delineates it from the lower-body color. It's a striking look, and most eyes would agree that the longer, sleeker Clarity is better-looking than the homely Toyota Mirai, the other dedicated fuel-cell vehicle on the market. The electric and plug-in hybrid Clarity have body-color roof panels. The Clarity's interior is relatively conventional, with a luxurious feel and materials, and very few of the Mirai's unusual controls or hard plastics. The Clarity Plug-In Hybrid is powered by a specially tuned 1.5-liter inline-4 engine paired with the latest generation of Honda’s two-motor hybrid system, which supplants a conventional transmission. The drive motor, rated at a substantial 146 kilowatts (181 horsepower), produces 232 pound-feet of torque and can power the car itself in many cases, especially in low-speed use. Its 17.7-kilowatt-hour battery pack sits under the front and rear seats and the rear-seat floorboards. We found its performance to be sufficiently strong in electric mode for all but a few types of mixed-use driving. In the low-volume Clarity Fuel Cell version, the motor that powers the front wheels produces 130 kw (174 hp) and 221 lb-ft of torque. Honda estimates acceleration from 0 to 60 mph at roughly nine seconds, which we confirmed in some informal on-road testing during a test drive. Like hybrids and electric cars, it uses regenerative braking to recharge a small battery pack, but that's used only to boost acceleration temporarily—it doesn't power the car for any meaningful distance. The new Clarity's 5.5 kilograms of hydrogen-storage capacity—at 10,000 psi—give it an EPA range rating of 366 miles, though like an electric car, aggressive driving style can cut the estimated range substantially. (Our Clarity Fuel Cell never showed more than 250 miles.) The Mirai, by comparison, is rated at 312 miles. Honda is particularly proud that its fuel-cell stack and all associated electronics fit under the hood in the same volume as a V-6 engine and transmission combination. Finally, the Clarity Electric features a 25.5-kwh lithium-ion battery that has a projected range of 89 miles. With virtually every smaller electric car now rated at 107 to 125 miles, and a Chevy Bolt EV at 238 miles, the battery-electric Clarity is thus at a major disadvantage. Buyers will have to place a high value on the comfort and size of a mid-size sedan over a compact hatchback to make up for its range disadvantage, though the price is expected to be in line with those vehicles at roughly $35,000. Honda leases the Clarity Fuel Cell only to households in carefully chosen areas of Northern and Southern California that lie within range of small, but growing number of hydrogen fueling stations. But as zero-emission vehicle options, both Clarity versions are likely to be swamped in volume by total sales of more than a dozen battery-electric vehicles now on the market, including the Tesla Model S and Model X, and a host of shorter-range electric cars as well. The three-year lease on the Fuel Cell costs $369 a month, and comes with 20,000 miles a year and $15,000 of free hydrogen fuel—a major plus when a 60-mile refill with hydrogen cost us $16. Honda hasn't yet released pricing or lease details on the Clarity Electric. For buyers uninterested in electric cars, or incapable of plugging in—and who are also lucky enough to live near a hydrogen fueling site—the Honda Clarity Fuel Cell offers a way to drive with zero tailpipe emissions aside from water. Its primary rival is the Toyota Mirai sedan, although Hyundai also leases a Tucson Fuel Cell model in even smaller numbers. The Clarity Electric will compete with close to a dozen battery-electric cars available in California, with longer ranges but in smaller packages. A similarly sized Tesla Model S, on the other hand, has almost three times the electric Clarity's range—but for twice the price. But it's the Clarity Plug-In Hybrid, new for 2018, that's the important model. It provides the first viable, affordable competitor to the seven-year reign of the compact hatchback Chevrolet Volt as the most appealing plug-in hybrid on the market. Our 2018 Clarity PHEV Touring model purchased in January has serious computer error issues.The dealer installed a rear collision warning system along with active blind side monitoring. These are two safety features Honda omitted. The car with nearly 1300 miles on it and has now been sitting at the dealership for 19 days. On the dash screen up pops a continually rotating series of major component system failure warnings including BRAKE SYSTEM FAILURE. The dealer tried resetting the computer but the error reappeared. The dealer states HONDA IS AWARE OF THE PROBLEM BUT HAS NO FIX FOR IT. The problem for me the driver is I do not know if any of the warnings are real. If they are and the car is driven a serious safety issue would be at hand. This would be equivalent to playing Russian Roulette & not knowing if the cylinder coming up is loaded or not. This past Monday morning the dealer gave me the DTC codes of P0010 and P100C, both codes are related. Along with this I was given the information the VTC motor speed signal circuit malfunction is involved. I asked why not just switch out the computer involved covering this problem with one from a brand new Clarity PHEV. It would seem to be a simple cure. The dealer person said no. If you google past Honda problems these errors have appeared on other Honda vehicles. He continued, Honda will not have a fix for the problem available until approx. the end of July and a service bulletin not until September. Honda is aware of this problem and there are many Clarity PHEV vehicles across the country with the same incurable problem right now. I would like to state the dealership has been helpful and I appreciate all they are trying to do. The problem is with Honda, the manufacturer. We were given a loaner car while our $40k Clairity PHEV sits idle in the dealership. I contacted Honda corporate last week to find out what is going on & was told our case worker would call us back shortly. That was many days ago. Finally Monday Belinda called and told us exactly what the dealer said - no cure as of yet! Arizona has a lemon law that goes into effect once 30 days have passed and this issue is not corrected. For anyone considering buying a Honda Clairty PHEV you do so at your own risk in my opinion. No manufacturer should be selling a product they know is defective and for which they have no ability to correct. Their consumer service department is horrific in response to call backs and helpfulness. a Honda, that only produces water out of the tail pipe. hyd is grear!!!! !